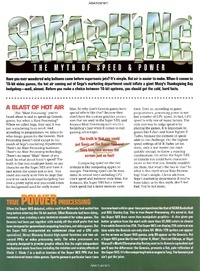 While the Mega Drive is indeed capable of faster processing performance than the SNES, particularly due to the Mega Drive's Yamaha YM7101 VDP graphics processor having a faster DMA unit along with higher memory bandwidth (see Sega Mega Drive/Hardware comparison for a technical comparison with the SNES), the term "blast processing" itself was vague and unclear, due to a lack of technical explanation from Sega. The term is thus open to interpretation, and has been interpreted in different ways, as a reference to either the Mega Drive's faster performance, its higher CPU clock rate, a specific DMA color trick (which is apparently what inspired the term), or just a meaningless marketing gimmick (as claimed by Nintendo). In more recent years, the term "blast processing" is occasionally used as a reference to the fast blitting capabilities of its DMA unit (see Sega Mega Drive/Technical specifications for details). As it transpires, "blast processing" was originally a reference to a graphical trick discovered by Marty Franz, taking advantage of a trick in the Yamaha YM7101 VDP graphics processor's DMA unit. On a Mega Drive, it is possible to change the colour palette during the H-blank interval by "DMA-ing" information into CRAM, however doing so has the (usually) unwanted side effect of creating CRAM dots - rogue pixels which would corrupt the image if the trick was used too often. 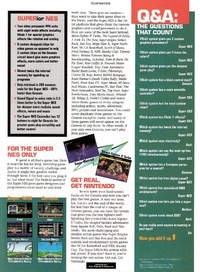 Blast processing was also used in conjunction with Sonic the Hedgehog 2 advertising, to suggest that it made Sonic "faster than ever". One trick used was tto have the ground speed cap removed, leading to a situation in Chemical Plant Zone where Sonic appears to out-run the camera. This was entirely the decision of the programming team behind the game, rather than a hardware trick. A more likely reason why Sonic 2 was chosen to demonstrate "blast processing" was its high-speed parallax scrolling, which was noticeably faster than what was seen in SNES games. While it is technically possible to match its scrolling speed on the SNES, it would require either significantly reducing the amount of graphics data on screen, or using enhancement chips. The Mega Drive's faster graphics DMA unit allows it to perform high-speed parallax scrolling with more graphics data on screen, which Sonic 2 was able to demonstrate to great success. It even maintained its speed at a higher 320x448 resolution in 2-player mode (compared to its standard 320x224 resolution), whereas the SNES wouldn't be able to reach such a speed at resolutions above 256x224. It claimed that the Genesis did not have any hardware or technology that gave a "Blast" boost. This is an incredibly vague statement to make, given that all part of the Mega Drive work in tandem to produce video games. It does, however, suggest that Nintendo were about as unaware of what blast processing really meant as most other people at the time. In more recent years, the term "blast processing" is occasionally used as a reference to the Yamaha YM7101 VDP graphics processor's DMA unit. A year before the 2009 revelation that the term "blast processing" originally referred to a DMA color trick, the retro blogger Trixter identified "blast processing" as the console's DMA unit in a 2008 blog post. Since then, the term "blast processing" has been occasionally used as a reference to the Mega Drive's DMA unit (see Sega Mega Drive/Technical specifications for details). The DMA blitting capabilities of the Mega Drive is comparable to the Amiga, with the Mega Drive being capable of even faster blitting than the Amiga (see Sega Mega Drive/Hardware comparison). Homebrew programmers in recent years have utilized the fast blitting capabilities of the DMA unit to demonstrate various technical feats on stock Mega Drive hardware (without add-ons or enhancement chips), such as Star Fox demos showcasing 3D polygon graphics (also in commercial games such as Star Cruiser, Hard Drivin' and Race Drivin'), Mode 7 style scaling and rotation (such as the Sonic Team Racing demo), an accurate port of Wolfenstein 3D with full ray casting (also in commercial games such as Duke Nukem 3D), software mixing allowing audio playback of multiple high-quality PCM sample channels (such as the Sonic: Next Level demo), and FMV playback (also in commercial games such as Sonic 3D Blast). The Mega Drive's DMA unit is thus sometimes viewed as a "blast processor".